Vodafone Essar the leading GSM mobile service operator has announced the launch of its new tariff concept called ‘Happy Hours’ to Mumbai telecom circle by launching of 3 new Bonus Card at Rs.19, Rs.21 and Rs.24 for its Prepaid GSM mobile service users. 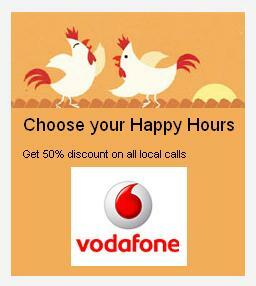 Under the ‘Happy Hours Discount Plans’, Vodafone prepaid customers will be able to avail a 50% discount on their calls that depending on time at which they call. Vodafone Bonus Card of Rs.19 provides 50% discount on local calls rates of customers existing plan from 6 am to 9 am. While Bonus Card of Rs.24 will gives 50% discount on local calls from 2 pm to 5 pm & Bonus Card of Rs.21 provides 50% discount on local calls from 11 pm to 2 am. All these Bonus Card will be valid for 30 Days from the date of recharge. The “HappY Hours Discount offer” cannot be clubbed with any local free minutes offer, friends & family and select plans by vodafone. How can change the happy hours system. Tell me. For Evening – its 2 owls. Great piece of marketing by Vodafone! !